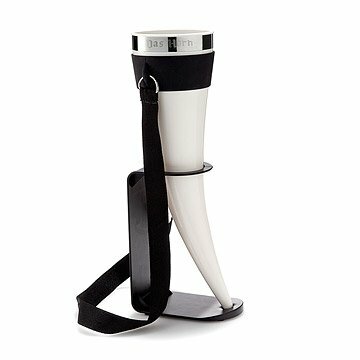 Storm your next party or barbecue like a viking with this epic drinking horn. Imagine you’re quaffing mead in a raucous Viking feasting hall or raising a horn of ale at a colorful gathering in the Seven Kingdoms. For anyone who doesn’t exclusively drink port from dainty crystal glasses, Das Horn is a handheld slice of sword and sorcery style. It holds a heroic 24-ounce serving of your favorite beverage and comes with a convenient stand to keep its unique shape upright (even if you're not). It also includes a neck strap to facilitate full, two-handed gesturing as you regale eager listeners at your next tailgate or Best Man's toast. The BPA-free horn is dishwasher safe, for when your last battle of the day is cleanup. Made in China. Alex Chatham studied Industrial Design at The Rhode Island School of Design and car design at the Istituto Europeo di Design in Italy. He has worked on projects for major global brands. His experience in product design and development spans a wide variety of projects, from full scale production and concept cars, to sporting equipment, electronics and packaging. Dishwasher safe. Not intended for hot liquids. My fiance's uncle is a Vikings season ticket holder and always invites us to tailgate. I wanted to get him something for his birthday that would show my appreciation for getting invited to the party. I came across das Horn and knew he'd love it. He can't wait to use it in the parking lot come September. SKOL, Vikes! Perfect gift for friends if Scandinavian descent who are impossible to shop for. Great quality and very comfortable to hold with or with out the strap! Definitely a conversation starter, great for when you want to feel like a Viking but with the comforts of modernity. Got this for a friend for Christmas. He LOVED how clean it looked and thought the strap that holds the actual horn was awesome. So much better than even I thought!